After a long day of work, the first thing most people want to do is get home and relax. Say it’s a nice day out and you want to sit out on your patio in your back yard, eat some dinner, and enjoy the rest of the evening. Instead of making trips in and out of the house, why not take the comfort of your kitchen outdoors with a new or updated back yard space that’s perfect for entertaining, cooking, and relaxing. Outdoor kitchens are a trend that we believe is here to stay but, if you’re not sure which appliances to include in your design, don’t worry! We’ve rounded up some of the ‘must have’ appliances and other features for your outdoor kitchen. The first ‘must have’ is your grill. The two different grill styles are free-standing or built-in. 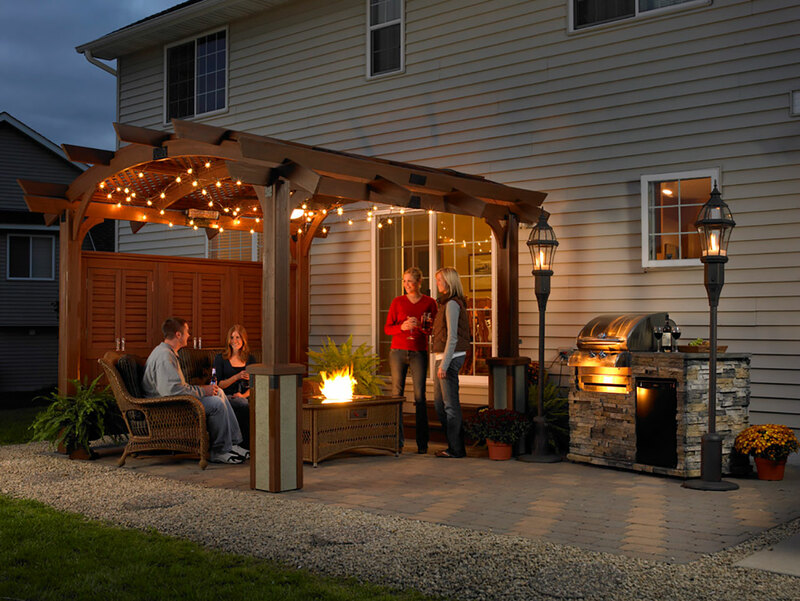 The benefit of a free-standing grill is having the ability to move the grill around to different parts of your patio or deck. Free-standing grills can also be rolled into a stone grill surround. The grill surround will increase counter space and storage. These are also commonly known as ‘roll in grills.’ The benefit of a built-in grill is having a large counter space to either side of the grill for prepping and serving food. And below the counter will be room to add storage and other appliances to make your outdoor living more convenient. Each grill will also have a specific fuel type, or a combination of them. A typical grill will either be charcoal or gas fueled. Certain grills, which can also be classified as ‘smokers,’ are fueled on wood chips (or pellets) to provide different flavoring to the food being cooked. There are also higher-end grills on the market that use a combination of all three fuel types to add even more delicious flavoring options to the food being cooked. The second must-have on any outdoor kitchen is an outdoor rated refrigerator, because the only thing that goes better with delicious food is a cold beverage. The first benefit of an outdoor rated fridge is keeping your food and drinks cold and readily available. This will help prevent you from making multiple trips into the house to grab another round of cold drinks, or more food to throw on the grill. Also, if you aren’t cooking all the food at once, you can leave everything else in the fridge until the time comes to cook what’s left. And at the end of the night, when it is time to pick everything up, all your food will already be stored in the fridge, minimizing what needs to be brought inside the house. The third must-have feature for your outdoor kitchen is storage. In a built-in kitchen, there will be space below the counter to install storage drawers or cabinets. Drawers can range from a single drawer to multiple drawers, stacked on top of each other. There are also paper towel drawers, ice chests and even warming drawer. And just like your indoor kitchen, cabinets can be essential to keep all the food at a perfect temperature. Overall, these storage drawers make it convenient for keeping things like spices and utensils on hand for when you need them. Another important addition to any outdoor kitchen is a trash receptacle. When entertaining a group of people, one of the last things you want to see, or even smell, is the trash. Built directly into the outdoor kitchen, this feature is typically a stainless-steel drawer that can be pulled out with one or two trash bins inside. When the drawer is closed, there is no worry of animals accessing the trash. But most of all, there is no trash laying around your outdoor living space. Once again, minimizing the cleanup at the end of the night.